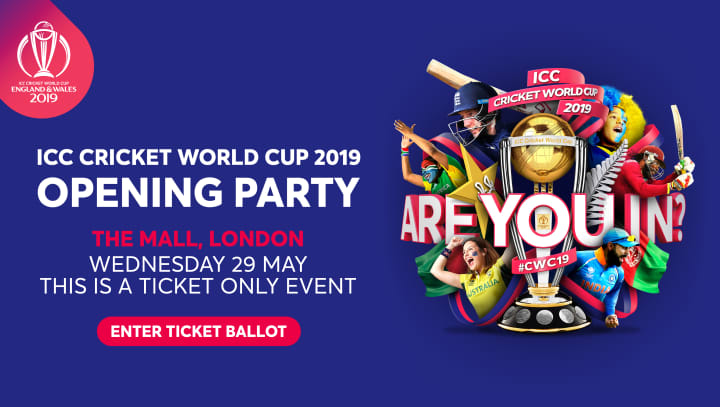 Details of the ICC Cricket World Cup’s live Opening Party have been revealed, which will be taking place two days before Trent Bridge’s opening fixture in the competition. The party will take place on The Mall in central London on Wednesday 29th May from 5pm. The event is being billed as a ‘surprise show’, but organisers are promising a production that captures the essence of the World Cup, featuring a mix of music and dance alongside a ‘winner-takes-all’ competition involving some of the biggest names in sport. All 4,000 tickets for the show are free, and are being allocated via a ballot running between Thursday 4th April and Wednesday 1st May. The show will also be broadcast live on television. All eyes will then turn to Trent Bridge for the first time on Friday 31st May, with Pakistan facing the Windies. This will be followed by four further World Cup games in Nottingham, with tournament favourites England’s fixture against Pakistan on Monday 3rd June sure to be a highlight. Games between Australia and the Windies, India v New Zealand and Australia v Bangladesh will also take place across June. A range of tickets are now back on sale for the ICC Men's Cricket World Cup 2019 matches at Trent Bridge, including limited seats to watch England v Pakistan on Monday 3rd June. Purchase your tickets through the Official CWC19 Ticketing Website.